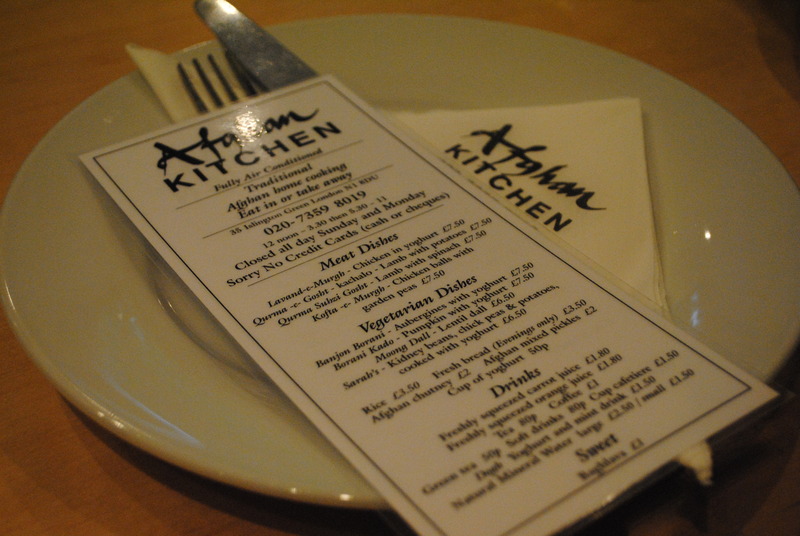 Tucked away in a small space off of Islington Green is the Afghan Kitchen, a teeny tiny restaurant and takeaway service offering Londoners a taste of Afghanistan, a place many of us only see through our television screens and associate with political strife and complexity. As Eric Ripert describes, food is truly a cultural phenomenon that informs our traditions and is a way of connecting us all. For those of us who know little of Afghan culture and traditions, the food at the Afghan Kitchen gives us another perspective of Afghanistan, the more cultural perspective, beyond what we see on TV. This is definitely a cuisine that deserves a wider audience. The small downstairs space is tightly packed with a couple of chairs to wait for takeaway and a glass counter separating the kitchen from the public with the day’s hearty stews on display. Upstairs there are a couple more tables, designed for patrons to share in a very much ‘grab whatever seat is available’ kind of approach. The menu is simple, straightforward, no muss no fuss and delicious. 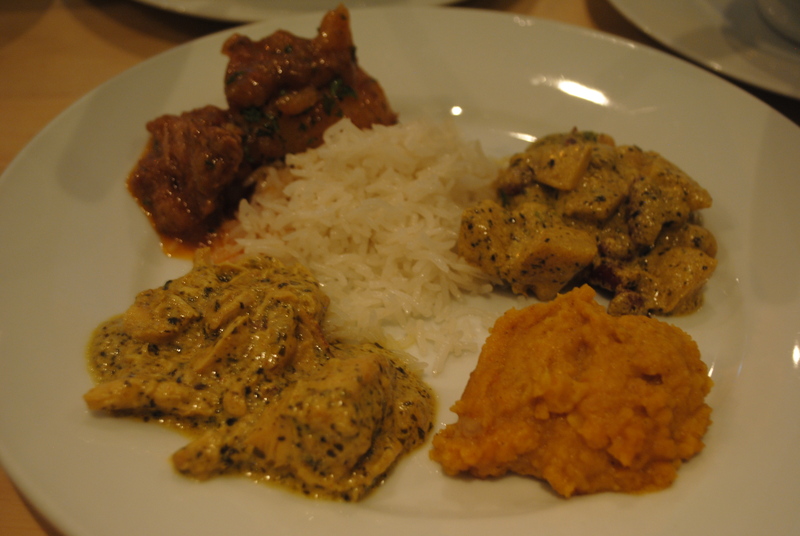 Afghan food is very varied – it’s a cross between Turkish, Middle Eastern and Indian with some influence from Central Asia,due to Afghanistan’s position along the Silk Road, a trading route connecting East and West. At Afghan Kitchen, the vegetarian dishes include things like banjon borani, aubergines with yoghurt and borani kado, pumpkin with yoghurt. The moong dall, a red lentil daal, is fluffy and orange, full of flavour and spices. 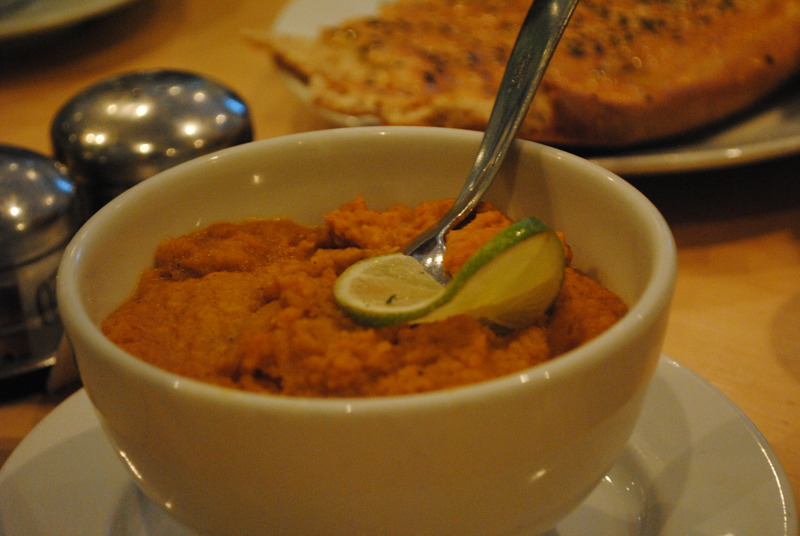 Unlike an Indian daal which is soupy, the Afghan dall is more like a thick fluffy purée. 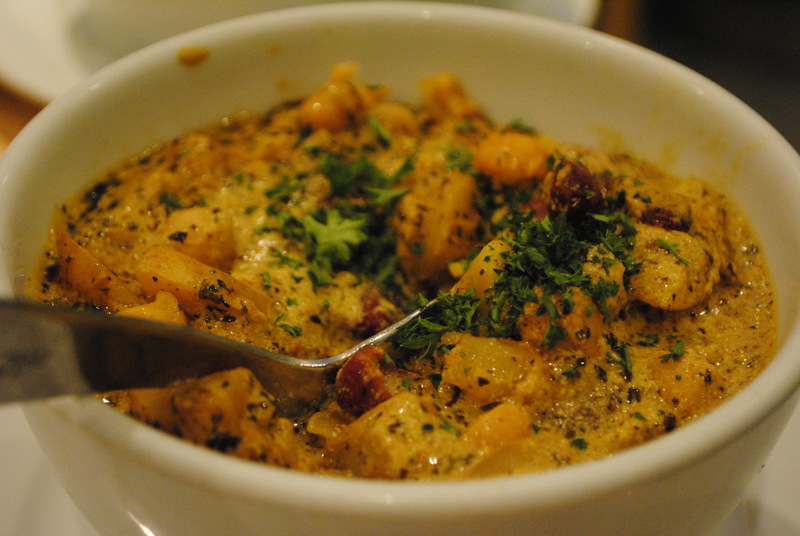 A dish called ‘Sarah’s,’ containing kidney beans, chickpeas and potatoes cooked with yoghurt was also delicious, cooked with mint and some other indiscernible spices that the waitress claimed not to know what they were, but really I think she was just hiding the chef’s secret recipe. The meat dishes were wonderful. Lavand-e-murgh, chicken in yoghurt was cooked in the same sauce as Sarah’s. The chicken was slow-cooked and tender with the exact spices still TBD. 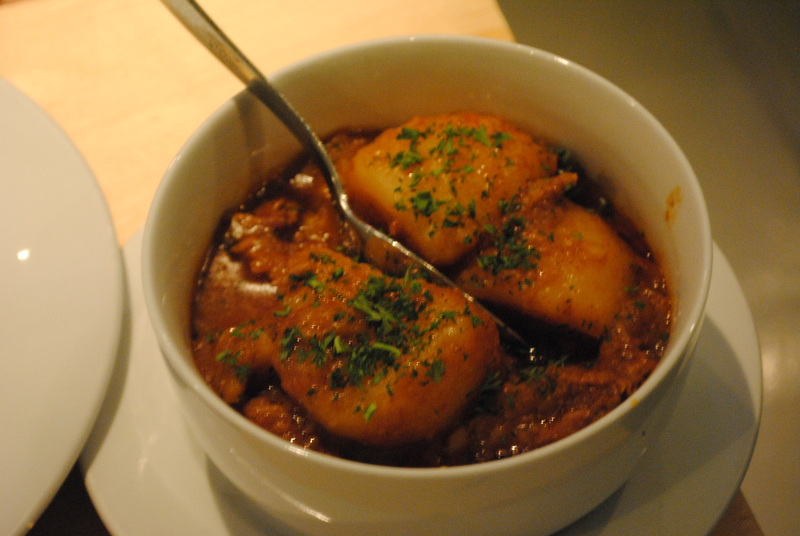 Qurma – e – gosht – karalo, lamb with potatoes, was also hearty and rich, the perfect comfort food. Fluffy pilau rice and fresh bread were perfect for soaking up every last bit of sauce. Whilst the downside of the restaurant would be the lack of space and absolute necessity to book a table (which they do allow! yay), the upside would be the affordability — the prices are extremely reasonable, ranging from £2 for sides and up to £7.50 for some of the meat dishes. I’m not sure where else you can get such a satisfying, delicious and inexpensive dinner in central London. Having never been to Afghanistan, I can’t vouch for the authenticity of the food. However, I know good food when I taste it. 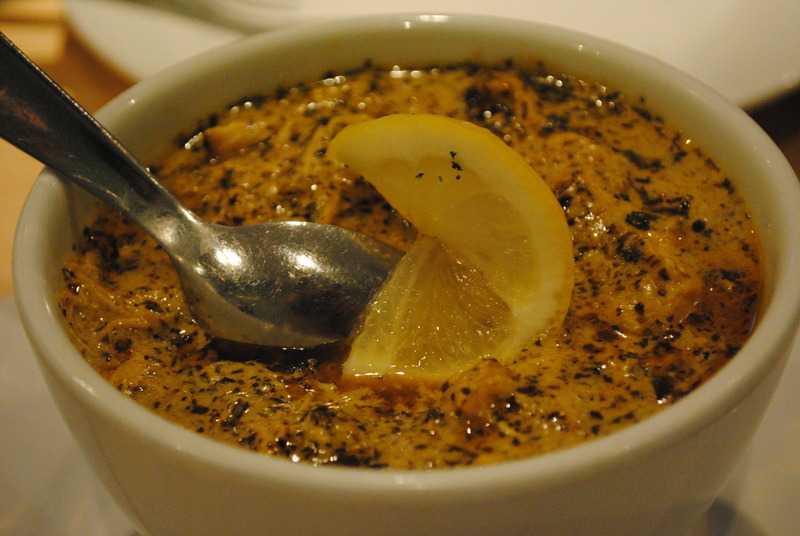 This is some of the best food I have had the pleasure of consuming in London out of all the different cuisines on offer in this fine city– and I recommend it wholeheartedly. 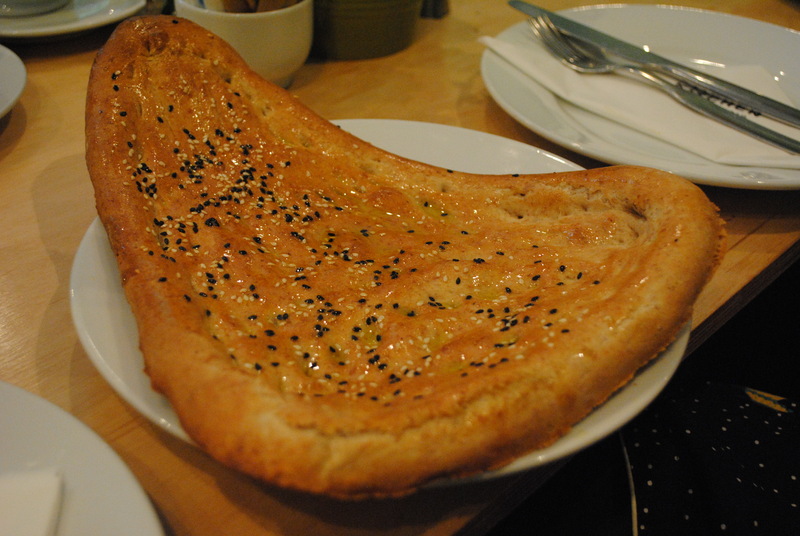 Posted in Restaurant Reviews - LondonTagged Afghan food, Afghan Kitchen, Afghani cuisine, Asia, delicious, India, Islington, lentils, London, Middle East, pumpkin, spices, yoghurtBookmark the permalink. Seems like an extremely interesting place to have a meal. The food looks delicious too- I’m definitely going to make a visit! Yes you definitely should! I forgot to include in my post that the restaurant is closed on Sundays and Mondays.